With an entree lineup that's a meat-lover’s Magna Carta & Holy Grail all in one (add bacon to anything for $1 -- yes, please! ), The Bentley Tavern is a choice spot for anyone with an animal appetite (not like the Muppet; they don't serve drums or anything). 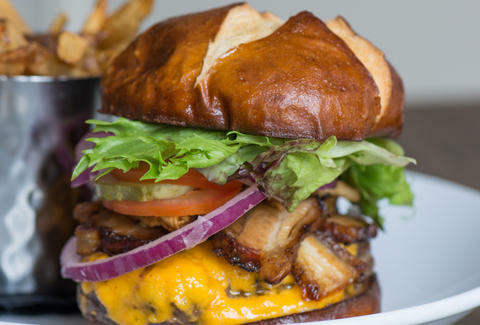 Let us direct you to the choicest vegetarian-unfriendly items on the menu, starting with this Bentley’s Burger, boasting layers of grass-fed beef, pork belly, 8yr-aged cheddar, chanterelles, house-made pickles, and some veggies (sigh, fine!) on a pretzel roll. The backdrop for your protein party is this impressively storied space that’s spent past lives as a brothel, a mortuary, and (you didn’t see this coming) an accordion school, and was more recently occupied by Palette and, before that, Lucca’s. 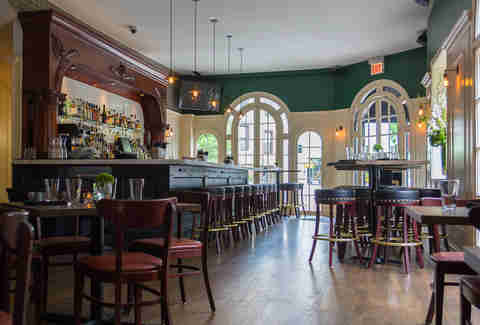 They've preserved the intricately handcrafted bar and the arched windows while resisting the urge to put on spinner rims. Back to the meat! 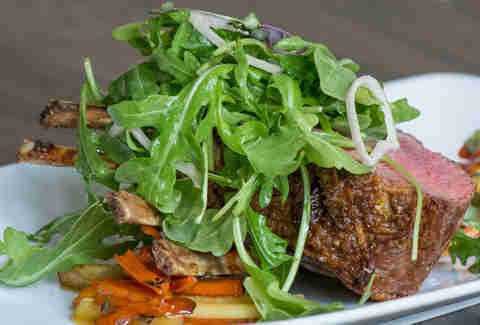 This sacrificial rack of lamb, accompanied by honey-glazed root veggies, gives a whole new meaning to counting sheep at night, so count every bite before you lapse into a food coma. Looking for something with wings instead of hooves? 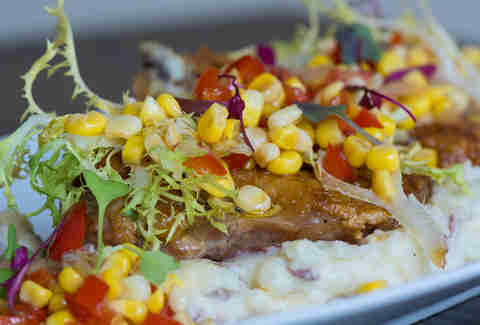 Try the half chicken in a sweet corn vinaigrette served on a bed of buttermilk mashed potatoes... hey, that sounds like a great place for a post-lamb nap! Drink break! 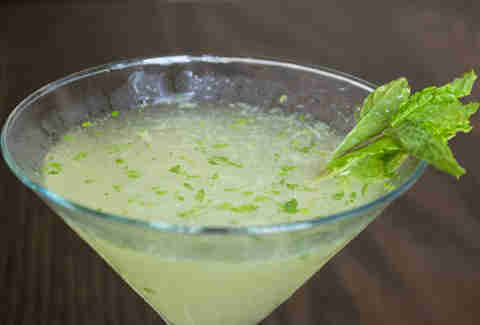 In between meat mastication, you might want to take a breather to sip the West Side: a palate-cleansing mix of vodka, fresh-squeezed lemon juice, and mint. 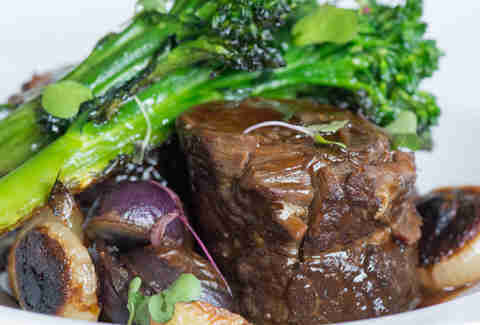 Also likely to induce a food coma: this boneless braised short rib with broccoli rabe, charred cippolinis, and baby potatoes. 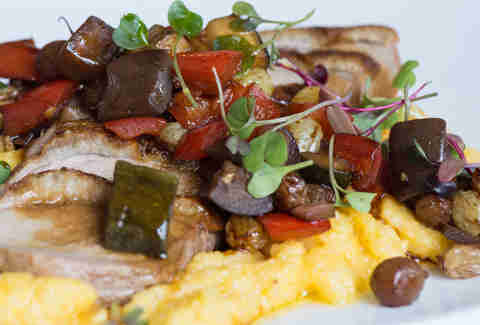 Closing down your meat tour is this duck breast served on cheddar polenta, loaded with aubergine caponata, and glazed in a saba reduction -- carnivorous enough for you, yet refined enough for your WOMAN! WOMAN! WOMAN!